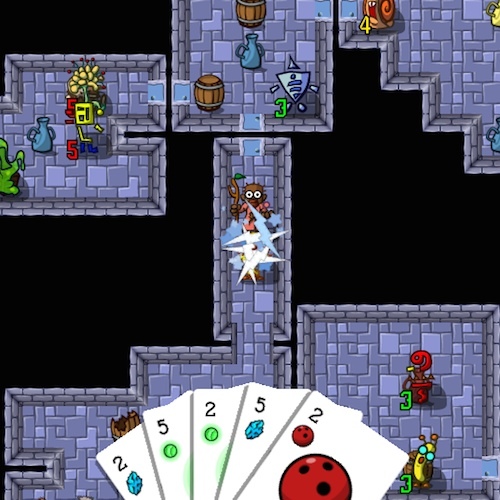 is a roguelike RPG with poker-esque card based combat and a quirky sense of humor. We Slay Monsters releases is now available on Steam and itch.io! "It's a well done, poppy roguelike remix that called me back several times." Quick-playing, turn-based RPG Gameplay, With poker-esque card based combat. We Slay Monsters streamlines traditional roguelike RPG gameplay and introduces a unique poker-esque card based combat mechanic. Each profession (Wizard, Rogue, Warrior) has a unique deck of cards; using this deck you will guide your hero through the dungeon. The Academy For Dungeoneering, where heroes are made. The once famous Academy For Dungeoneering has fallen on hard times and its arch-rival, The Institute of Evil, has been left unchecked. You must rebuild the academy and fight the Institute of Evil. Heroes come and go, but your Academy is persistent; build it up over time to make your heroes strong and better able to face more difficult challenges. We are looking for a new Headmaster! Do you have what it takes? Work your way through the campaign and find out what the Institute of Evil is up to. Unlock new abilities for your heros, and unlock new and more powerful monsters to challenge you. There are four unique types of missions: Story missions, which move you through the campaign; Random missions, which give you side quests to help earn gold and unlocks; Arena missions, where you fight ten rounds of monsters to claim victory, and finally Weekly Challenge missions, which allow you to compete against everyone else to see who is the best!